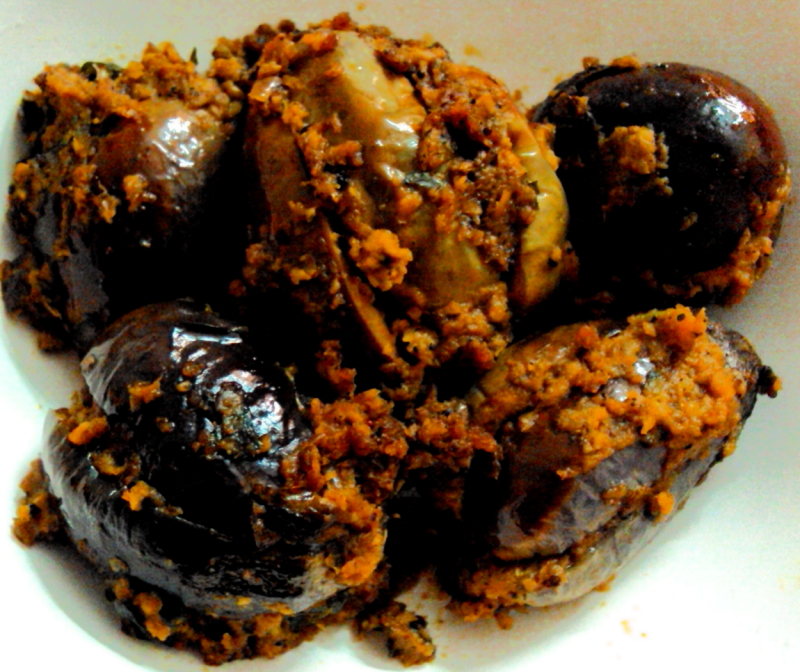 Easy variation of stuffed brinjal recipe is given here.U can use fresh grated coconut instead of coconutmilk powder.U can serve this dish dry or with thick gravy.Believe me,it is an easy( and tasty) preparation to try at home. Grind onions,tomato puree,coconutmilk,peanuts,turmeric powder,ginger,garlic,saunf,ground spice powder,salt,chilli powder,peppercorns,green chilli and coriander powder into a fine paste using mixer-grinder. Cut the brinjals into 4 pieces (not fully-leave little stem part) and stuff the ground masala inside. Heat oil in a kadai,add curry and coriander leaves and saute the brinjals so that they turn little brown on both sides.Now,clean the ground masala jar with 1 cup water and add it to the kadai with the left-over ground masala (if any). Allow this to boil,stirring at times till water runs dry. Serve this tasty stuffed brinjals with rice and sambar,curd rice etc or with Indian breads. Hi Sreeanka!,no need to scoop out the flesh.The stuffing shd not be so fine(coarse paste).It will come out well. After cutting the brinjals, if we don't scoop out the flesh part, then how can we fill in the stuffings? Thank u so much Anantha Padmanabhanji,so good to see u back here after a long time. Thank you christy for the receipe. It is tasty and quick method. I hope ujala brinjal will give tase more.